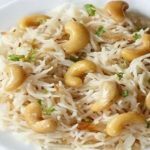 Kaju rice is a rice dish whose recipe involves cooking it in a stock prepared by adding spices and cashew nut (Kaju in Hindi). Kaju pulao is especially, cooked in basmati rice because it is easier to prepare a pilaf or polao. Basmati rice stays light, fluffy and separate while cooking. Soak basmati rice in 3 cup water for 30-40 minutes. In a deep pan pour 1 tablespoon of oil along with 1 tablespoon ghee put it over low flame. As soon as the ghee warms a little, add 2 inch cinnamon stick, 4- 5 cloves, 3-4 cracked green cardamoms, 1 cracked black cardamom, 1 teaspoon black cumin seeds. Fry for a minute. Further add 1-2 slit green chilies. Then add the cashew nuts and fry continuously stirring. Fry till cashew nuts turn light golden. Do not over fry it, as it will give a bad taste in the recipe. Now add 2.5 cup of water to it, and 1.5 teaspoon salt into the water then let it boil. Close the lid till the water comes to boil. Then add 2-3 drops of kewra essence into it. Mix a well. Kewra has a natural fragrance resembling basmati rice. 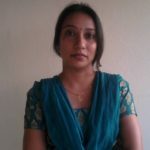 Adding kewra essence in water improves the fragrance of rice further. This step is completely optional. When the water starts to boil, add cooked rice into it and stir gently and cook it over high flame with closed lid. Stir occasionally in between. Cook around 4-5 minutes till rice gets half cooked. When the water start to dry up add finely chopped mint and chopped fresh coriander leaves. Mix well. Then cook it covered for 8-10 minutes on low flame. In a fry pan add 1 tablespoon clarified butter and put it over low flame. When the clarified butter warms up add 8-10 cashew nuts and fry continuously stirring. Fry till cashew nuts turn light golden. Drain out the cashew nuts and put them on a kitchen towel to cool down. On cooling they will become crispy. 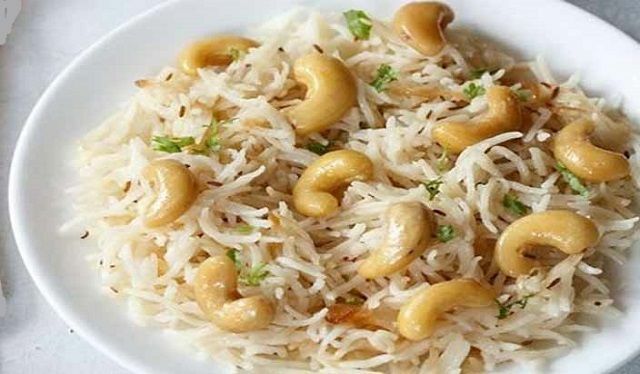 Take out the Kaju Pulao in a plate, garnish it with fried cashew nut and finely chopped fresh coriander leaves. Serve hot with Murgh Musallam recipe.